Kenton Jones is the General Manager on Necker Island, a position he has held since 2010. Prior to leading the Necker Island team, Kenton and his wife, Leesa, originally met on Necker where they respectively worked as Activities Director and Operations Manager and Spa Director. From there they took their adventure to the Atlas Mountains and held the positions of General Managers at Kasbah Tamadot for two years. Kenton’s favorite past time is kite-surfing – ideal for Necker Island! 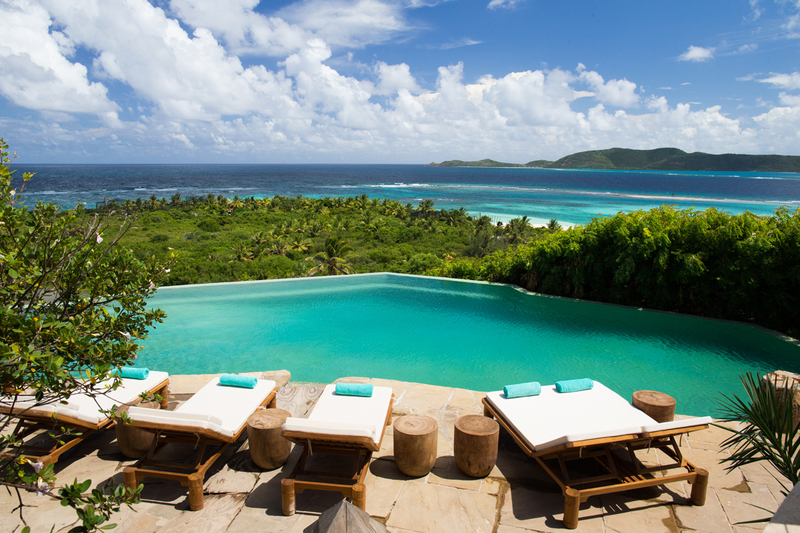 Tucked away in the British Virgin Islands between Tortola and Anegada, Necker Island is one of the most idyllic and unspoiled locales in all the Caribbean. 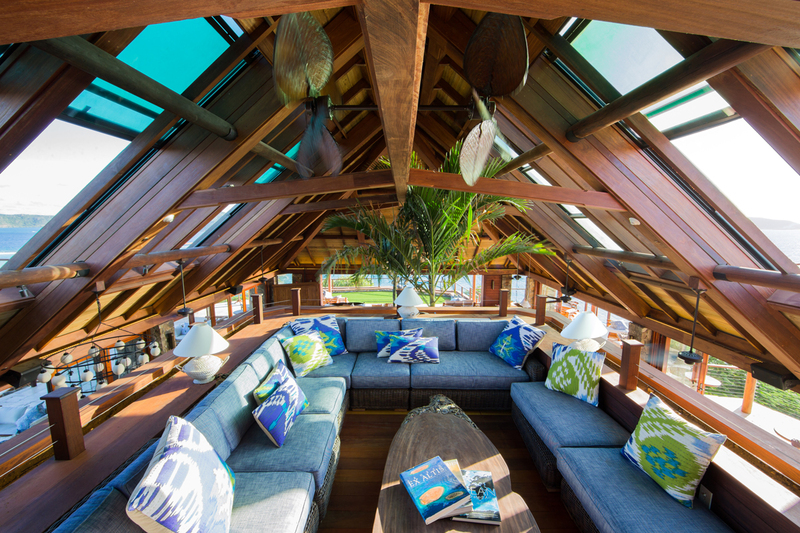 As with all great stories at the centre of Necker’s history is a love story. Sir Richard Branson had been trying to impress a girl he had fallen for and upon hearing that an island was for sale in the BVI he approached the realtor who offered an all-expenses paid trip for him and a guest to see the island. As Richard and his guest strolled around the (then-uninhabited) Island they dreamed up plans for turning it into a haven for musicians. Smitten with the unspoilt paradise, and keen to impress his new love, Richard offered the highest amount he could afford. The realtor was quick to decline the offer, and left the couple high and dry to find their own way back home. A year later, with no other offers on the table, Richard was approached about his initial offer. Virgin Records was in a much better position than it had been a year before, so Richard quickly agreed to purchase with a promise to build a resort on the Island within four years. Today Necker Island boasts world-class amenities, facilities and service. Guests can expect to discover a 74-acre hideaway complete with white sandy beaches, luxurious accommodations, watersports, top class food and the holiday of a lifetime. As for the girl… he married her there 11 years later in front of all their family and friends, and two children, Holly and Sam who were bridesmaid and page boy. 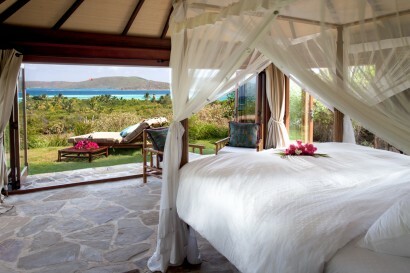 Necker Island is situated in the British Virgin Islands located in a stunning and unspoilt area of the Caribbean. It sits in turquoise waters surrounded by coral reefs and fringed with beautiful sandy beaches. By private launch Necker Island is approximately 30 minutes from Tortola and 10 minutes from Virgin Gorda where there is another smaller airport. It is also possible to reach Necker Island by helicopter from Tortola, Virgin Gorda and St. Thomas, arrival and departure launch transfers to the island are included in the rates. • Kite Surfing: If you fancy giving it a go then we can teach you in a controlled, safe environment on Necker Island. • Waterskiing and wakeboarding: We have beginner and advanced waterskis, wakeboards and offer high quality instruction for all these activities. • Sailing: We have a fleet of Hobie Cats located on Main Beach and offer beginner to advanced sailing instruction. • Paddleboarding: Otherwise known as ‘stand up paddleboarding’. Necker has a range of paddleboards (10ft –14ft long), and people of all shapes and sizes can have a go at this easy but fun watersport. • 8 Person Paddleboarding: If you fancy having fun with friends all on one Paddle board then our inflatable 6 – 8 person SUP boards are for you. • Sub Wing: Subwinging allows you to experience the ocean in a whole new way. Riders are towed behind a boat allowing them to turn and dive by holding onto the 4-foot carbon fiber wing. • Snorkelling: Snorkels and masks are provided for in the wardrobes in your rooms and there are fins located on both Turtle Beach and Main Beach. Both beaches offer excellent snorkelling depending upon weather conditions. • Scuba Diving: The waters of the British Virgin Islands have a superb range of dives. Wreck, reef and night dives can all be arranged to suit your level of adventure. • Necker Island is home to a stunning array of wildlife including scarlet ibis, giant tortoises, iguanas and lemurs flewn in from Madasgar, and much more! 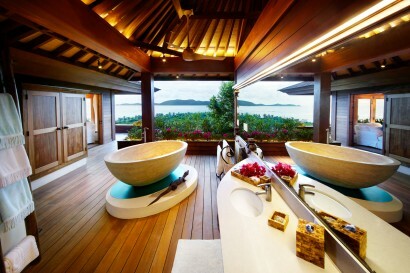 • Necker Island is home to over 400 flamingos, yes, real ones, on island. 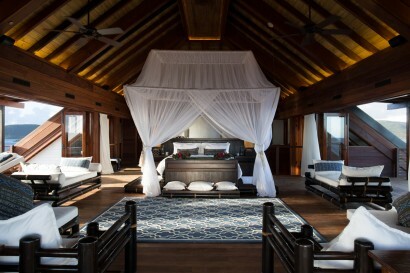 • Necker Island has a team of over 100 staff to make our guests’ experience on island will be truly unique and memorable. • Zip line – a thrilling and fast way to get down to the beach! 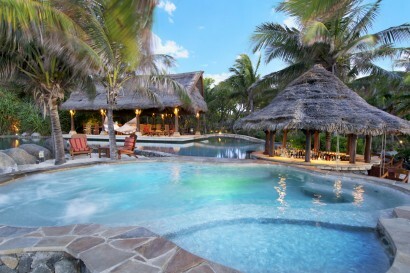 • Necker Island is Sir Richard Branson’s home and favorite hideaway and where he married the love of his life. On Necker there are plenty of things for children to do, most of which will keep them active all day long! From amazing treasure hunts to meeting the lemurs near the beach pool, there are surprises around every corner. Kids could also spend the day splashing around with inflatable toys in the beach pool before enjoying a pirate party on the sand. Kids can stay in the super-equipped Bunk Room at the Great House which is full of toys, books and video games. We have cots, baby baths and other baby essentials, available on request. Babysitting is provided at an additional cost. Children’s meals can be provided any time. Choose from a selection of tasty, well balanced, healthy and fun meals keeping both the parents and kids happy! 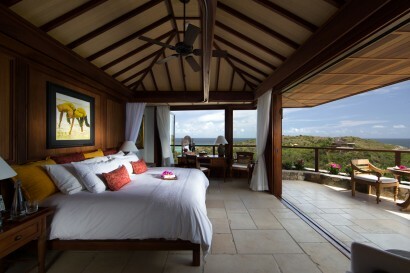 The spacious Master Suite is located on the top floor with amazing views which can be enjoyed from one of three terraces. The hot tub and outdoor bathtub are located on the largest terrace and there is also a flat screen TV built into the foot of the bed. It is equipped with a king size bed, spacious en-suite bathroom and kitchenette area. 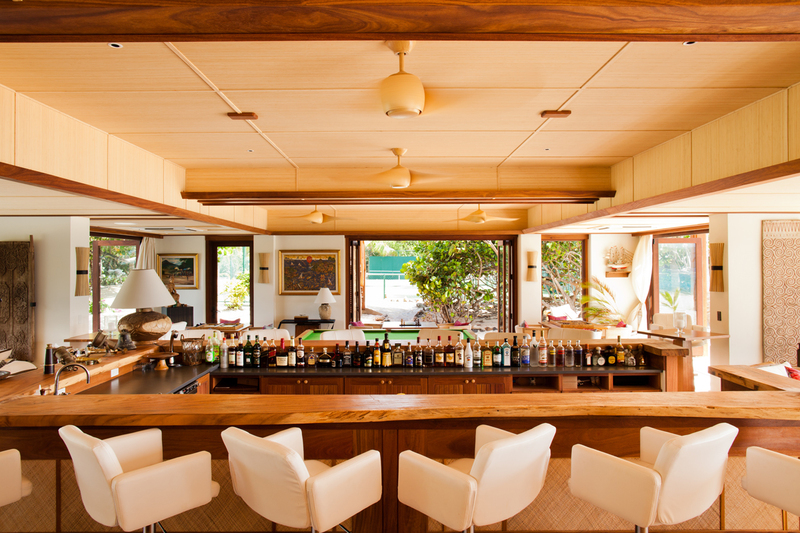 Situated in the middle of the island with panoramic views, this house was built to Sir Richard Branson’s exacting standards and boasts a beautiful freshwater pool, large lounge with TV and surround-sound system. There is also a free-standing marble bath – ideal for soaking as you gaze out to sea! Bali Beach – Size: 650 square feet: A beautiful double room all on one level with private entrance and terrace complete with a relaxing daybed. And, it’s only two steps away from the plunge pool. This room can be arranged with twin beds. Bali Hi – Size: 1343 square feet : A three-tiered Bali house, with a ground floor lounge area, a bedroom is located on the middle level, and on the top floor is a cushioned relaxation area with spectacular views along Turtle Beach. Bali Hi has two bathrooms both with outdoor showers. Bali Cliff – Size: 633 square feet: One of the most romantic settings you’re ever likely to experience. Bali Cliff perches on the edge of the island facing out to sea and has a double-bedroom and open air bathroom to maximise the views and sounds of the ocean. The Indonesian word for bird, this spacious room has a king-size bed, uninterrupted views out to the sea and a spectacular terrace. A three-tiered Balinese house, with a ground floor lounge, a bedroom located on the middle level and on the top floor a cushioned relaxation area with spectacular views out to the ocean. The Indonesian name for fruit Bali Buah is built adjacent to Bali Lo. This spacious double room has an en-suite bathroom below and a large balcony with chairs and a hammock affording fantastic views of the fruit trees and the ocean. This room can be arranged with twin beds. Located nearby Temple House and accessible by a short grass footpath, the Love Temple is a private and spectacular room with a covered but open air bathroom at the back and its own lawn terrace. 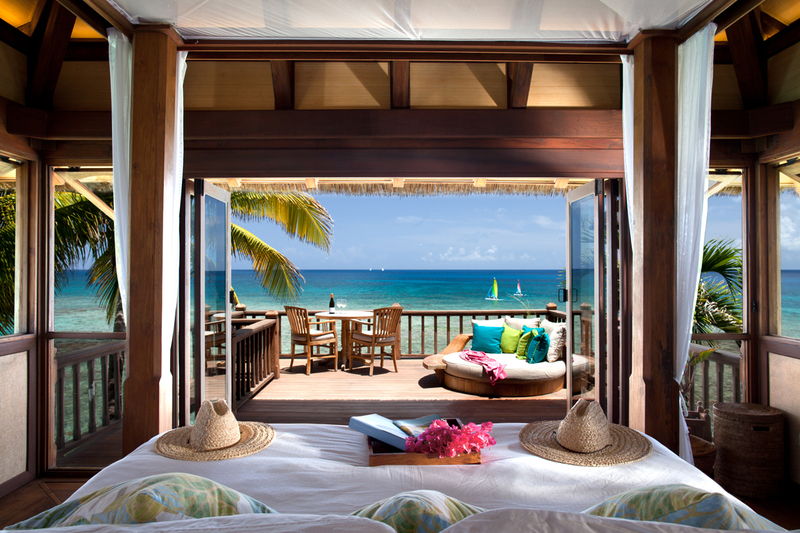 Each guest room comes with a large balcony with views overlooking the ocean or across Necker Island. The king-size bed in most cases can be split into twin beds, except room 5. All rooms feature an en-suite bathroom with a shower and have windows looking through the bedroom out to the views. Rooms, 2, 3, 7, 8 and 9 also feature an additional outdoor shower on their balcony. Room 9 is our most accessible room, with step free access. Rooms 2 and 3 and 7 and 8 interconnect with each other, while rooms 4, 5 and 6 can be linked. Rates are fully inclusive of all food and beverages, including champagne. The Great House – Dinner at the Great House is a revelation with a variety of themes to make each night unique. 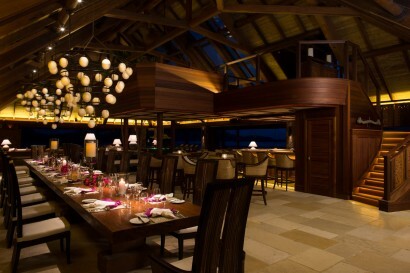 Meet at the bar for cocktails and head up to the roof terrace where dinner will be served while you watch the sun set. 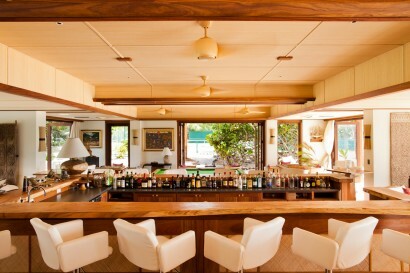 The Beach House – On the upper level of the Beach House is a huge dining table that can seat up to 40 guests at any one time with views overlooking the tennis courts to one side and the ocean to the other. Turtle Beach – Turtle Beach is a great option for lunch – we usually organize a sailing race around the island which ends at Turtle Beach for a drink and either a picnic style or BBQ style lunch. If you fancy an afternoon activity the nearby reef promises some great snorkeling opportunities. 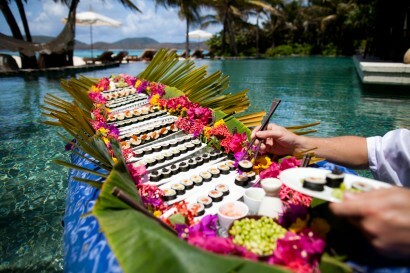 Floating Sushi Bar – We offer a very unique twist to the traditional sushi bar and serve the sushi in a floating kayak filled with ice and decorated with beautiful flowers! 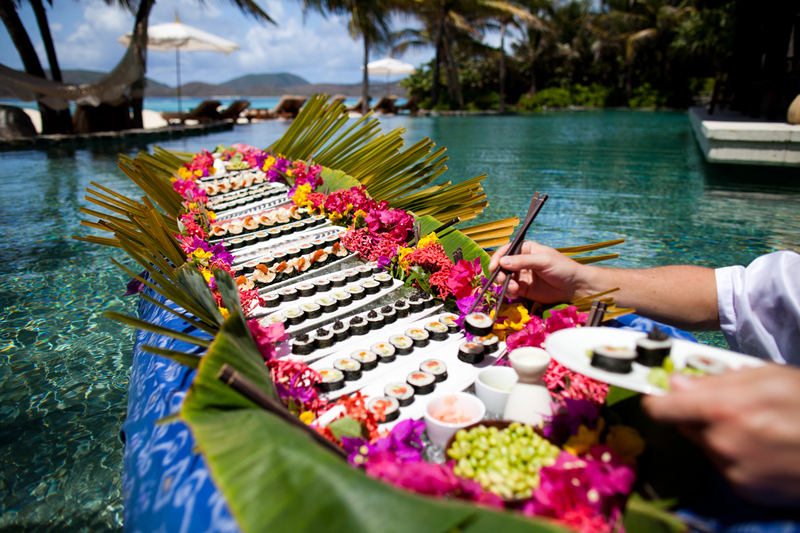 The chefs float the kayak down the Beach Pool and are there to tell you what decadent rolls and sashimi they have prepared. 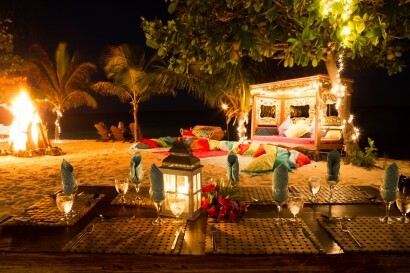 Bali Hi Beach – Bali Hi Beach is one of the most beautiful dinner settings you will ever experience. After meeting in the main house for cocktails we’ll drive you down to the beach where you’ll be enchanted by a candlelit dinner, a large bonfire, and the sound of the waves crashing on the beach. • The Pools – The Great House has an infinity pool with beautiful views over Necker Island and of the ocean. Just off Main Beach is a second infinity pool which can be accessed from both the land and the beach. The swim-up bar off the freeform infinity pool is complete with seats in the pool where guests can sit and enjoy a drink plus there is a huge hot tub right on the beach with space for more than 30 people. • Tennis: Our owner has always been a big tennis fan so it’s no surprise we have two floodlit Astroturf tennis courts next to the Beach House. Both courts have beginner and advanced racquets along with ball baskets in the huts by the courts. We have a resident tennis pro who can organise individual or group lessons, tournaments or someone to hit with if you fancy a challenge. 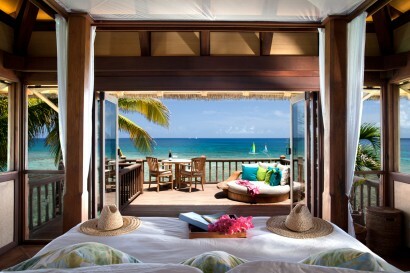 • Island Walk: Necker is 74 acres in size with a 3 mile perimeter. There are a number of trails on the north end of the island which will take you around the coast or over the main ridge. Staff can take you on a guided tour and share some interesting facts about Necker, or simply point you in the right direction to brave it alone! • Yoga: Classes can be arranged at various locations on the island. It’s a great way to appreciate the island’s spectacular sunsets. An extra charge may apply for this activity. • Zipline: Try our zipline which will take you all the way from the Great House down to the Bali Hi complex and then down to Turtle Beach. Combine this with Lunch on the Beach and it is the perfect way to arrive! Necker Island mostly caters to celebration events like weddings, birthdays, and anniversaries, as well as incentive groups. We can accommodate up to 200 guests for a reception. UV Night – Make the dress code white for the night and dance the night away under our black lights wearing glow stick accessories! Casino Night – Las Vegas comes to Necker for those that would like to try their luck at the blackjack or roulette table. Guests are asked to dress in white, black, or red with a touch of glitz and glam, and are given Necker poker chips at no expense to play with for the night! The guest with the most chips at the end of the evening will be presented with a prize the next day. Moroccan Night – Our sister property, Kasbah Tamadot, has inspired us to test the delicious dishes of Morocco on Necker. Moroccan night is a relaxed evening with a continuous flow of amazing dishes served either buffet or family style. To add some more diversity to the night, each guest will be provided with a brightly coloured coin skirt to wear throughout the evening. Disco Fever! – Necker has a huge collection of funky hats, glasses and accessories for guests to wear that will help transform your night into a disco party! Ask your guests to bring an outfit of your choice (many opt to coordinate disco night with Austin Powers costumes) to make this evening even more funky and fun. We set up a variety of coloured disco lights and let the tunes play until the last one goes to bed. If you really want to pump up the tunes, hire DJ Wizz for an additional charge and he will really get the party going! Tribal Night – Party in tribal attire for the evening! Foliage, fun fabrics, and face paint will be provided to all guests in their rooms and the idea is to get creative. Create headdresses out of leaves, tops and skirts out of fabric, and wear your bikini to dinner with your face painted in black! This truly is a fun evening if everyone gets involved with their costumes and comes ready to party. Greek Night – Dress and eat like a Greek tonight! Our chefs create an amazing Greek style buffet and we provide the togas and accessories to make you and your guests look and feel like a true Ancient Greek! Beach Party! – A party on Main Beach is a night to remember forever! We set up large speakers, disco lights, a cushion area for looking at the stars, and of course have a fully stocked bar and a bubbling 30-person hot tub to enjoy. Incorporate a fancy dress theme if you want to really go all out, or hire a band to play on the stage at the edge of the beach. Masquerade – our newest theme is a great excuse to dress up and have a bit of fun. Think feathery masks, elegant dresses, suits and a sumptuous six course gala dinner. The Great House is the perfect elegant atmosphere for this trendy new theme. •Island tours and wildlife feeding: You will see a stunning array of wildlife on Necker Island during your stay. You can even get involved with feeding them! Just let us know which species you’re interested in and we’ll arrange this. There are lemurs, flamingos, scarlet ibis, giant tortoises, iguanas and much more.